If you’re having trouble accomplishing everything you need to do in a given day, it might not be because you’re overloaded with work or you’re a poor time manager. It could simply mean you need a refresher course in the Urgent-Important Matrix. 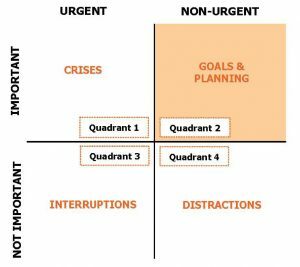 “What is important is seldom urgent, and what is urgent is seldom important,” said former President Dwight Eisenhower, in what is thought to be the first verbalization of the Urgent-Important Matrix. But you don’t have to research Ike or read the book to grasp the idea. All you need to do is take out a blank sheet of paper and draw two intersecting lines to create a simple grid. The x axis defines urgency and the y axis defines importance. Urgent tasks cry out for immediate action. They make you want to stop what you’re doing and react to what’s come up. Important tasks help fulfill your mission and achieve your goals at home and work. You arrive at the office to discover that a critical document (which you haven’t yet drafted) must be filed by noon. A client calls with a pressing problem. The building’s fire alarm goes off. It’s stressful to operate in this quadrant. Minimize your time spent here. Do this by planning, delegating and prioritizing. You develop a succession plan for your law practice. You prepare a comprehensive timeline of activity for a new litigation matter – and then you calendar all action items. You start thinking about your summer vacation well in advance. This is your magic quadrant, say the experts at Coaching Tools. Maximize your time spent here. Do this by planning for the future and seeing the big picture. A happy consequence: your stress is reduced. A difficult client calls for the fifth time this week. Your email notification dings. You are called into an unexpected meeting. This quadrant makes you feel frustrated and stuck. Minimize your time spent here. Do this by sticking to your to-do-list, delegating and saying no. A chatty colleague drops by to rehash last night’s ballgame. A new cat video is posted on YouTube. The sun has come out and a lovely afternoon beckons. Spending a little time here is okay. It can boost energy and improve your mood. Spending too much time – or doing it unintentionally – can leave you feeling bummed out, lazy and ineffective. And it might get you fired. Eliminate time spent here unconsciously by making a list of frequent distractions and devising strategies to deal with them (shut your office door, close the blinds). What tips do you have for prioritizing tasks and making best use of your time?